Ross, Jace and I walked across the border from Brazil to Bolivia with relative ease. Puerto Quijarro was a nothing town – dirty, dusty, smelly – just a mandatory stop on the way to somewhere better for travellers like us. We caught the infamous “Death Train” that night and arrived alive, though bone-rattled, in Santa Cruz the following morning. Here Ross left us to go into town while we weighed up our options for the onward journey to Cochabamba – do we wait half a day and explore Santa Cruz, taking a night bus? In a snap decision, we jumped on a bus scheduled to leave at 9.30am to make it to Cochabamba by 5pm the same day. We arrived in Cochabamba to the welcoming arms of the Dibos family. “Come in! Are you hungry? Here’s your room. Do you want a shower? Have some dinner.” Just what we needed after 3 days of near-constant travel. Our time in Cochabamba was lovely – some R&R in civilisation after the Pantanal – but all too short. We spent a lot of our time eating and talking with the Dibos’. Piti and Grace’s daughter, Olivia, and her two children, Santiago and Diana, had arrived the same day as us from Santa Cruz (they flew, however), so the house was full of people and, of course, the dogs. Piti kindly drove us around during the day to see the Christo (taller than Rio de Janiero’s by about 80cm) and search for a new backpack for me. At night, we went out with Ignacio to play pool, drink and sample the local street food, trancopechos (“chest-blockers”), or stayed in and played Clue with Diana. After only 3 days, it was time to move on, so we jumped on another bus, this time headed to Oruro, only 4 hours away, and then took a night bus to Uyuni. You can read about that (mis)adventure in Jace’s previous post. Uyuni is the gateway to the Salar, a massive salt flat surrounded by volcanoes that is larger than Belgium and can be seen clearly from space. 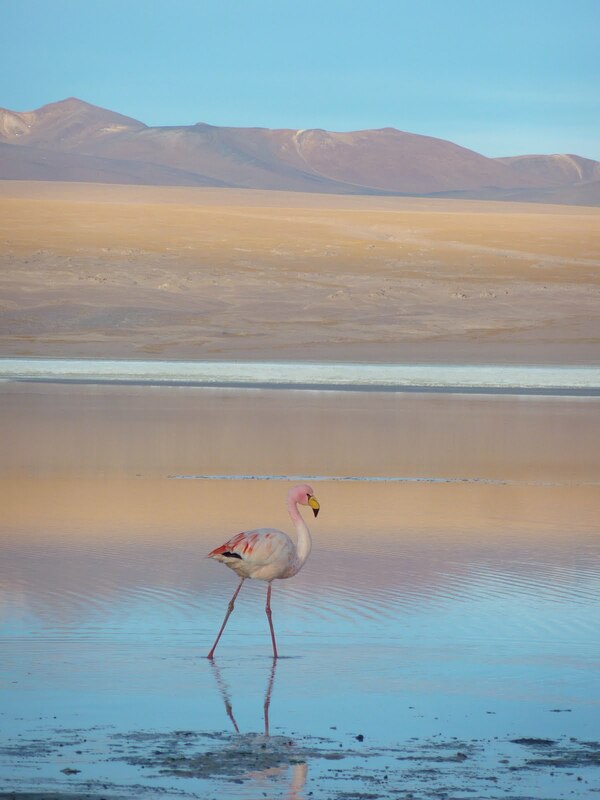 It is one of Bolivia’s huge draw-cards for tourists from all over the world and there are dozens of companies offering 1- to 4-day tours into the Salar and on to the Altiplano. After visiting about 6 of these companies, Jace and I went with Red Planet, conveniently located next to our hotel and recommended by a fellow traveller. We met our guide, Oscar, before deciding and his easy manner and good English, as well as his honest “I can’t promise that we will see flamingoes in the lakes. I only saw five on the last trip” had us sure that this was the right tour to be on. South America is incredibly small when you’re a tourist. We ran into Kyle from the Pantanal tour on the street in Uyuni (we also met him outside the bus station in La Paz 5 days later) and decided to go together to the highly recommended Minute Man Pizza for dinner. Of course, we ran into Chris and MC, also from the Pantanal, at the pizza place that night, and enjoyed sharing tales about our travels, including the (not so) mysterious quitting of the kitchen girl the day after our group left the Pantanal because she was “unhappy.” Methinks the thief escaped unaccused. Our 3-day tour of the Salar left the next morning. There were two other couples in our group: Jan and Mark from the UK and, and Danka and Tomas from Poland; both couples were coming to the end of year-long journeys around the world. It was great to be on a tour with like-minded individuals and we really enjoyed their company, especially over cards and wine on our second night, when we taught them how to play a card game named Golf and were beaten by the Brits. The tour itself was amazing. The landscapes of the Salar and the Altiplano are harsh and unforgiving. Our first day was spent driving across the Salar itself, where we saw how the locals mined for salt, visited a hotel made from salt, climbed a cactus-covered island, and finally took some funny photos that played with perspective. It was cold, dry and stunning. The second day we climbed higher, away from the Salar and into the desert. Here the volcanoes dominated the landscape, coloured red, green, yellow and white from the minerals in the soil – iron, copper, sulphur and lithium. The vegetation was limited to Andean grass, green moss and a small bush which also contained minerals drawn from the soil and apparently burned very well because of them. Stopping beside Laguna Cañapa for lunch, there was one lone flamingo, grey from lack of shrimp, but still sticking around despite the cold. 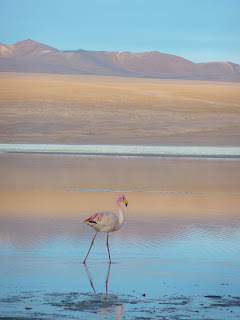 Farther on, we saw the famous arbol de piedra (stone tree), surrounded by rock outcrops in even stranger shapes, and continued on to the Laguna Colorada, where we were happy to see a number of pink flamingoes. That night we slept 4,600m above sea level, near the lagoon. First stop on the third day took us to the Sol de Mañana Geyser. The smell of sulphur was overpowering as we wandered between the treacherous-looking pools of bubbling mud. One slip and the gases and heat would probably kill you even before you before you got sucked under. Next stop was a thermal spring where only Danka braved the cold air to immerse herself fully in the warm waters; the rest of us settled for bathing our frozen feet. Last stop before the Chilean border was Laguna Verde, which seemed more white than green due to the borax (potassium chloride) that sat all around it. No flamingoes here; the water is highly toxic. We dropped Jan and Mark at the border and then drove back to Uyuni via the Laguna Colorada again and the striking Valle de Rocas. It had been a fantastic journey through alien landscapes. The bus ride to La Paz was blessedly uneventful, thanks in part to a couple of sleeping pills popped at the beginning of the trip. La Paz was a great place to relax and regroup after the freezing south. Despite being the world’s highest capital city, it has a beautiful climate – sunny and relatively warm (until the sun goes down). We enjoyed walking around, buying a few important items, like a new pack for me, and watching the World Cup at various popular backpacker haunts around town. We visited a couple of museums, seeing Inca treasures in gold and silver and learning a bit of the history of Bolivian independence, as well as the Coca Museum for a biased but comprehensive history of the sacred plant and how the West (read US) has turned it around. Interestingly, Coca-Cola apparently still uses coca, but just the leaves for flavour. Eventually, it was time to move on to Cusco and our impending Inca Trail trek. We would be well acclimatised after 2 weeks “at altitude”.